Heritage Place Assisted Living was very nice. It is the place that I have been trying to get my mom in. I really enjoyed the tour. It was nice. The person who assisted us was very nice and very helpful. The dining area was very clean. They took me into a couple of different rooms that were very nice. The only issue I had with them was the parking as there was hardly any. Heritage Place Assisted Living feels more like an apartment than an institution; that's important. The person who helped me was very helpful. I didn't try the food, but the fact that the staff is all eating there is encouraging. I know they have several activities, but I didn't observe any. They have a pool, an activity room, and a gathering room. They try to organize activities several times a week. Heritage Place has been excellent with us. They have worked with us, they have gone overboard helping us, and they've been very nice to us. They're feeding my parents good and making sure that all their needs are taken care of. They're in the memory care unit and they are together in one room. They do crafts together, drawing, they make bracelets, they sit around and kick a ball, and they play music with them. Heritage Place was nice, clean, and a little bit older. They have activities for the residents. I liked that it's smaller and my mother has trouble remembering, so she gets lost a lot. This place is great for someone that has trouble with directions or remembering things because it is smaller and so there are less chances for them to get lost. I talked to a few of the residents and they were very happy there. They just loved the place. The staff was very friendly, but I never got a follow-up call. They have a central laundry there. The best way to get to know a community is by scheduling a tour. See the facilities, meet the staff and residents, and get a feel first hand what it's like to live at Heritage Place Assisted Living Assisted Living. 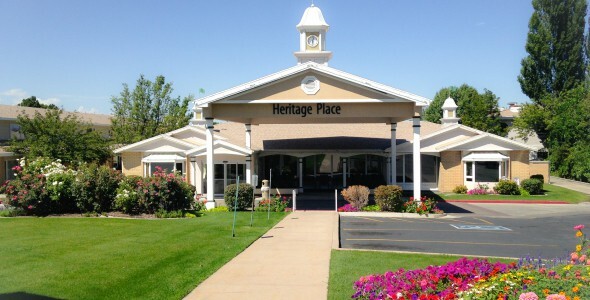 Offering a full spectrum of senior services from independent living to assisted living to memory care, Heritage Place Senior Living is a stately retirement community located only 10 miles from downtown Salt Lake City in Bountiful. Our quiet, suburban community is nestled between stunning national forests to the east and the shores of the Great Salt Lake to the west. Heritage Place Senior Living is owned by Blue Harbor Senior Living. An operator of senior communities based out of Portland, Oregon, Blue Harbor Senior Living has communities in six states. At Heritage Place Senior Living, our residents can enjoy restaurant-style meals in either one of our two dining rooms, check out a book from our well-stocked library and page through it in our sunny atrium, swim a few laps in our indoor pool or get their hair done in our on-site beauty salon. Our billiards room is always open for a game of pool and our computer center provides an easy way to stay in touch with family and friends. Our large chapel provides a quiet place for worship as well as weekly church services and our charming outdoor playground is popular with visiting grandchildren. We are proud to provide all our residents with exceptional service and care. Residents in our assisted living and premium assisted living (also known as Type 2 assisted living) programs are cared for by Certified Nursing Assistants who are on site 24 hours a day. Residents in our memory care program reside in a secure environment and are checked on regularly up to every two hours for their safety. Our caregivers are specially trained in dementia and Alzheimer's care and are available around the clock to offer assistance and escorts as needed. With deluxe accommodations, superb amenities and high quality service, Heritage Place Senior Living offers something for every senior, no matter where they are on life's journey.